It seems that this has been a very popular post but -'thank you' Blogger- even if you search using the exact title the result is "Post not found". As usual I had to go and Google the title and, guess what? It does exist! I have been asked whether I know of shops that sell Berol pens. I would say go online -Ebay more than Amazon.uk which appears to have drifted towards fantasy on its prices. I did have this idea, put to Berol, to carry a back cover advert for their pens on the back of all Black Tower books in return for a sponsorship. Message received -no response. To be honest, I had thought of making the same offer to Sharpie -oddly, their metallic pens are great for adding fine detail to models/toy soldiers!- but I've not had that much experience with their pens for art. When I first wrote this post it was the early 2000s. I've up-dated it a few times since and I have had to drop and change implements as things change. If Berol, Sharpie, Spirograph or any other art related company would care to sponsor CBO just get in touch! My hands are now such that using Chinese brushes is difficult ( I LOVE these brushes and first started with in the mid-1980s after picking some up in China Town (London) while visiting Fleetway and Marvel UK. Well, no more business trips since the comic industry died and when my old Chinese brushes eventually reached the end of their work lives I purchased a set of Crimson and Blake Chinese brushes from an old Chinese supermarket in Bristol...ten years or more ago. I just realised it was much longer ago than ten years!! Here is my article as published in 2016 and I'll update as I go. Considering I had a conversation today with someone who had no idea what to draw comic strips with -he was starting out and was telling me how he was about to order the most horrifically expensive "graphic pens" you can get, which are not much good- I remembered the old post. I keep getting asked by people trying to get started in the industry what I would recommend to draw with. Okay, you see an artist uses pure sable brushes or this tech-pen or that one -all very highly priced. The thing is that unless you are rich or have stepped right into a very well paid long term art job you are wasting money. For an artist every single penny counts and job security is …well, not something artists get very often! (I have no idea whether I was being sarcastic there -comics and job security??). I have used Rotring pens (over priced and not great -this was in the 1980s), Guillotte nibs, caligraphy pens and even the very cheapest fibre tip you can get. I HAVE used brushes and still do but mainly for inking in large areas or effects. I used to go to the old Westminster Comic Mart in London and visit China Town to buy cheap brushes and b-i-g bottles of black ink. I am not joking about big bottles of ink. A bottle would cost under £2.00 which is what you could pay for a 14 ml Windsor & Newton bottle of black ink. Take a look at this -the label went years ago but think of the amount of ink and that saved an artist a LOT of money (I think the bottle last 4 years). 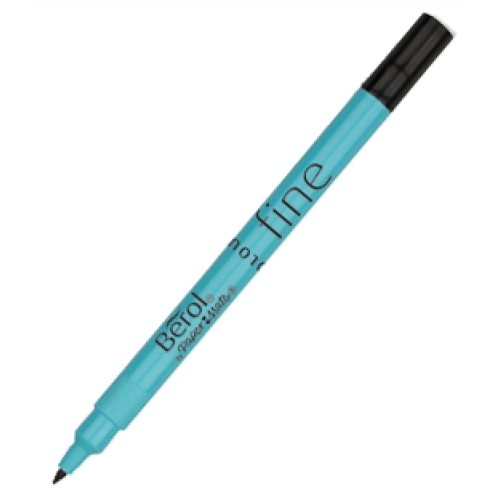 However, if you try Berol you can find Broad and Fine tips but also Handwriting pens that allow you to draw using an even finer line. You can do almost everything the very expensive pens can and quickly. The only thing I would say is, once you’ve inked art using a Berol pen give it time to dry and do not try to erase pencil lines straight away as it can smudge. You can also take Berol pens around with you for sketching. The colour Berol pens I have had little experience with as they are harder to find. However, I knew one artist back in the 1980s (Paul Slydel) who only used Berol colour pens to colour and when I first saw his work I thought he had been using brushes and colour inks. Hard to find these days and if you do the price can be high. You have to find the bloody pens first but I’ll come back to that in a while. There is the Uni Ball “Eye” which is about 0.5 despite saying “Fine” and most “fine” pens you’ll find in stationary shops and W. H. Smith are 0.5 which is not what I call fine at all. In fact, the Berol Fine is about 0.3 when new but after usage will get to a 0.5 line but the good thing is, if like me, you live in a cluttered working area with LOTS of brushes, pens and pencils, if you lose your Berol Broad -good for filling in large areas of solid black though BIG areas of solid black I still use brush-ink, then the Fine can handle the Broad’s job! The effect? Well, I tried drawing with a migraine the other day (the current weather is **** up my head) and my eyes…yeuch. But I did a rough for a cover I wanted. Yes, I can see the faults in the illo but no one is perfect and I’d not use this one any way! I posted it on Face Book and another site and then came the comments -was I using a “dip-pen” (Guillotte nib)? What type of brush was I using? I explained but some still think I’m joking. Seriously, this was all Berol Fine. 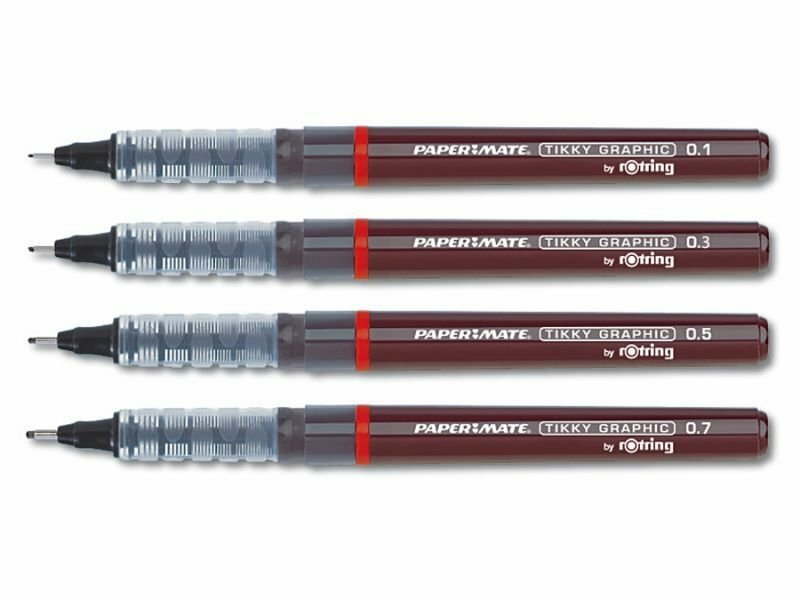 I did, at one point, use Papermate Rotring Tikky Graphic -these are designed by Rotring but came in a pack of three -0.3, 0.5 and 0.7 -a nice range of nib sizes though I would have loved a 0.1 and 0.2 combination as well. The three pens cost about £4.95 in Summer 2011 but have currently hit £7.90-£8.00 in Tesco and other outlets so, for me, that is getting too pricey. There were problems with these pens. I bought about three packs in 2011 and I found pens from different packs began seeping ink from them -just by the red seals you can see in the photo above. Now, unless they are clogging like the old Rotring pens (and you wonder why so many artists stopped using them?) then there has been a problem in filling them during manufacture. Each 0.7 from two packs got two uses out of them and then…no ink. This also happened with all three 0.3s which really **** me off. What also annoyed me was that in all the packs I purchased the nibs fell out of the 0.1 as soon as it touched paper. For, now (2016), £8 a pack of three I just simply would not recommend them. Put it this way, okay, they look sleek and well designed, but a Berol Fine, used properly can do the job of all three -skillfully used the Broad could replace the 0.7 if you had to. “Spatter” effect. No, I do not use a computer created effect (NEVER!!!) it is the traditional old way -ink on toothbrush and careful use of the thumb to get the spray right -experiment if you want to try this BUT make sure everything is covered up first and that includes other panels of art on a page you are trying it on!!! Bit of advice: some of us used to blow onto the brushes to make the ink splatter out -it'll make you dizzy so stick to thumb on brush! At the moment I have a big tub of about 50 pens -if you work like me then use a pen. Put it down. Lost,. Next! A better view from the side! These the basics I use:left to right -Uni Pin Fine Line with nibs 0.05/ 0.1/0.2/0.3/0.5/0.8. Pen #7 is a Pilot Marqueur A Dessin 0.2. The next a Uni-ball Eye Fine. Then the Luxol Micropoint 0.5. The legendary Berol Fine (blue) is next followed by the Berol Broad. Now I do have a big tin full of all sized brushes mainly for large solid black areas but you then have to wait for the ink to dry. So, for speed, that big chunky grey pen is a bog standard Permanent Marker -Berol did them but they are far too pricy. You can pick these up for 35p each or even packs of four for £1.00. Nice effects can be achieved with biro pens but that is something you’ll find out eventually through experimentation. Now, such is Room Oblivion that I have lost all my Spirograph wheels. They are here but where I have no idea. I was about to order a new set when my sister returned from shopping and carrying a 1965/1966 Spirograph set -complete for £2 from a charity shop. The box is not in perfect condition but these can fetch up to £29 on Ebay. There are extra wheels and I forget to put two of the smaller wheels into this display but they are there with the other parts. These instructions make what you get today seem almost for dim-wits. This is good stuff and no wonder it won a prize! I had to check this several times before I could believe it. The original Spirograph paper (divided into squares) in wrapper! The original base board (thick piece of cardboard) is still there! Oh yeah, this may get a lot of useage! Never ever be afraid to try odd things to see whether they work for you. The computer for a real hands on artist should always be the very last resort for special effects. Maybe if they had used Spirograph those people who claimed "This is done on the computer!" would know better. After 40 years Spirograph is still a good tool for me to use. But as freelance artists tend not to make a lot of money they need to keep costs down so Berol pens are perfect -as are various nib sized gel pens. Back in the 1980s-late 1990s you could not walk into a supermarket, newsagents or other store without seeing the tubs of Fine and Broad (black as well as the other colours) but today.. Saturday morning I went into W. H. Smith in Broadmead, Bristol and was astounded at what little selection in pens they have -all sorts of brands and prices but generally all 0.5! There was a big (b-i-g) box of Berol colour pens but at the price Smith’s were asking (I think £20 plus) I didn’t even consider them. But Broad and Fine black? No. Not one. In fact, I spent around an hour looking around City Centre shops -not one Berol pen in sight. This is a great pity because I think that for a working cartoonist/ comics artist/ illustrator there are no better pens. I’m told Berol may no longer be making Fine or Broad pens but as this only came from two store owners who did not seem interested or, at first, know what I meant, I’m hoping they are wrong. In fact I can add an up-date to this item. Everyone seems to be stocking Sharpie pens and they are relatively cheap but I hate them. Firstly, they smell! Secondly, with fat nibs they are nowhere near as versatile as Berol pens. A Sharpie cost 65p. A Fine Berol pen set me back £1.00!!! Berol needs to get on the ball because I would hate to see those Sharpies be the only pen out there!! And, yes, I asked Berol twice whether they might sponsor some features on CBO about their pens -supplying a selection so their use could be demonstrated. Nothing. Not a word. I have known any number of artists who have no idea how to use a pencil or pen on paper. 90% act very superior to you when you say you are what they call "old school"...but then you have to put up with their nervous breakdowns when their computer or tablet or whatever they use crashes (and they have not saved their work on external storage devices). If you cannot use a pencil, pen or brush and use your hands to draw on paper then you are NOT an artist. You may use a computer to 'draw' but storing up images to copy and paste onto new work because it saves time is without real soul -it's letting the device do the work. Yup. 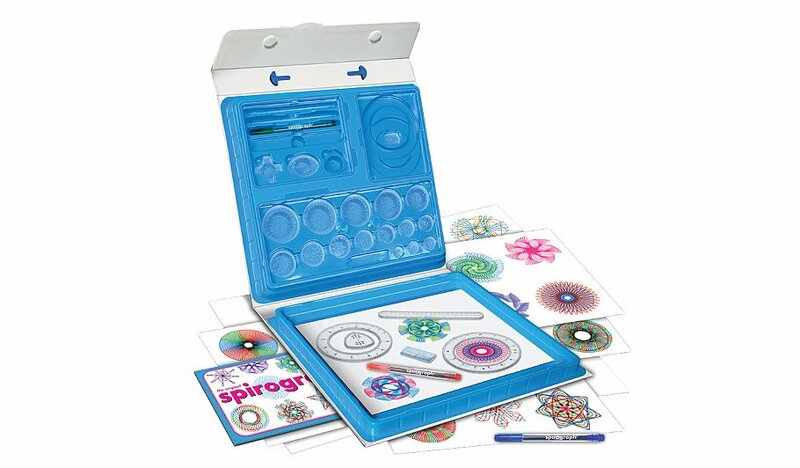 That's the Spirograph set I have, situated in a box beneath my drawing table, amongst loads of other stuff. But, of course, that's not the only go to for textures and effects. Many items can be used to draw. Scour nature for twigs. I have made pens from 'Golden Rod' which are very serviceable. A bit fibresome, initially, but have used to produce interesting drawings. Will have to see if my hands steady. May have to just draw bigger and shrink down. Nature has a warped sense of 'humour', programming an artist and then felling him or her with a tremor. Hateful. Does any of the companies produce any paper these days that has a decent grain? All seem to go for a smooth surface. Hardly any tooth at all. A plague upon their houses.